Below you will find dates for our All-Paddle upper canyon Adventures in 2019. Click the appropriate button below and search by month and number of spaces you need. This All Paddle upper canyon adventure requires a beautiful, yet strenuous hike out on the Bright Angel Trail on the last day of the trip. Be prepared to carry anywhere between 15-25 pounds (6.8-11.3 kg) of your personal gear out of the Canyon with you, as well as 3 quarts of water (weighing approximately 6 pounds or 2.7 kg). Although hiking time varies per person, the average hiker makes it out on the Bright Angel Trail in 6-8 hours. The mule duffel service is an option, but must be reserved for the DAY AFTER YOUR HIKE OUT because we cannot guarantee that we can get your gear to the drop-off location early enough for it to go out the same day. This will require you to stay an extra day and wait to pick up your gear at the mule barn at the South Rim. If you decide to use this service, you will still need to hike out all irreplaceable items, as well as your water and provided lunch. Whether you use the mule duffel service or not, you should be physically able to carry your gear out. If you plan to use the mule duffel service, reserve it early and call AzRA to let us know. Join us for our 7 PM orientation meeting the evening before your All Paddle upper canyon Grand Canyon rafting trip begins at the designated hotel in Flagstaff, Arizona. You’ll meet your fellow rafting team, receive your dry bags, go over last-minute details and learn how to pack your dry bags and what to do with your luggage. This orientation does not cover many river life topics because there are many more orientations while on the river to explain what river life is like! 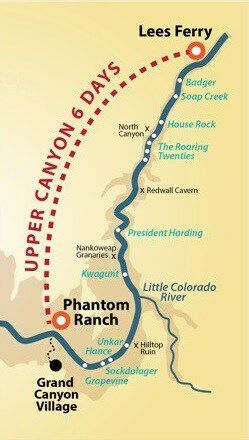 There are many options for getting to and from your All Paddle upper canyon Grand Canyon rafting adventure. See below for some tips on how to start planning your transportation details. If you are the physically active type who wants to participate in the most active Grand Canyon rafting adventure, who wishes to be a part of a team maneuvering your raft down river, who likes to push your boundaries and live a little more on the edge, then the All Paddle upper canyon adventure is the trip for you! We often get asked what the best time of year to raft the Grand Canyon is, and our answer is always “it depends on what type of weather you prefer!” You’re going to get different weather every month. Some months are more variable weather-wise, whereas others are more reliable. Below is a general guideline as to what type of weather to expect each month on your Grand Canyon rafting trip. Our All-Paddle upper canyon adventures are scheduled in May, June, July and August.